At least ten thousand people gathered in front of Congress to pressure senators to reject a bill to limit government spending for the next twenty years. SÃO PAULO, BRAZIL – On Tuesday, November 29th, while thousands protested outside Brazil’s Congress building, the Brazilian Senate approved a Constitutional Amendment (Pec 55 in Senate PEC 241 in Chamber of Deputies) that would limit government spending for the next twenty years. Demonstrators turned violent during the early evening hours, and police threw tear gas to disperse the crowd. 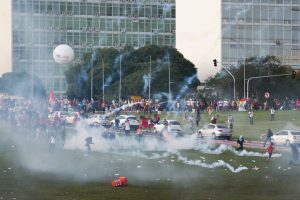 Police clash with demonstrators in Brasilia on Tuesday, photo by Fabio Pozzebom Agencia Brasil. According to police officials, at least ten thousand people gathered on the lawn of Brazil’s Congress during the day to pressure senators to reject the bill, which has already passed through the Chamber of Deputies. The Senate voted 61 for and 14 against the bill. Brazil’s President, Michel Temer, criticized the violent protests stating that government has always been open to dialogue, but will not accept the destruction of public and private property. “Intolerance is not a form of democratic expression and can not be an instrument to put pressure on Congress,” President Temer said through his presidential spokesman, Alexandre Parola. As the day wore on, a smaller group of demonstrators became more violent, turning against journalists covering the protest. A media outlet vehicle was turned over by a group of protesters, who also tore down signs, put fire to trashcans and spray-painted graffiti on ministry buildings. The Ministries of Education, Sports and Agrarian Development had their windows broken and air-conditioning units damaged by demonstrators. Demonstrators spray-painted the outside walls of the National Museum and the National Cathedral. As the violence escalated, police tried to contain the crowd by throwing tear gas at protesters, but the group was only dispersed late on Tuesday night. The bill proposes to limit the Union’s primary expenditure starting in 2017 to that spent the previous year. According to government officials, the objective of the amendment is to contain the recent surge in primary spending, which grew six percent above inflation between 2008 and 2015. The bill now needs to be approved in a second round of voting in the Senate, scheduled for December 13th, and then go for Presidential sanction to become a law.